Mary Doria Russell's debut novel, The Sparrow, took us on a journey to a distant planet and into the center of the human soul. A critically acclaimed bestseller, The Sparrow was chosen as one of Entertainment Weekly's Ten Best Books of the Year, a finalist for the Book-of-the-Month Club's First Fiction Prize and the winner of the James M. Tiptree Memorial Award. Now, in Children of God, Russell further establishes herself as one of the most innovative, entertaining and philosophically provocative novelists writing today. 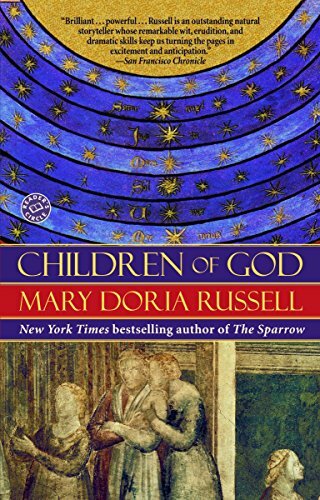 Strikingly original, richly plotted, replete with memorable characters and filled with humanity and humor, Chil-dren of God is an unforgettable and uplifting novel that is a potent successor to The Sparrow and a startlingly imaginative adventure for newcomers to Mary Doria Russell's special literary magic. If you have any questions about this product by Russell, Mary Doria, contact us by completing and submitting the form below. If you are looking for a specif part number, please include it with your message.